Yesterday (13 June 2016), the British envoy to the Philippines said that President-elect Rodrigo Duterte's economic program was an opportunity for the United Kingdom to contribute its expertise. 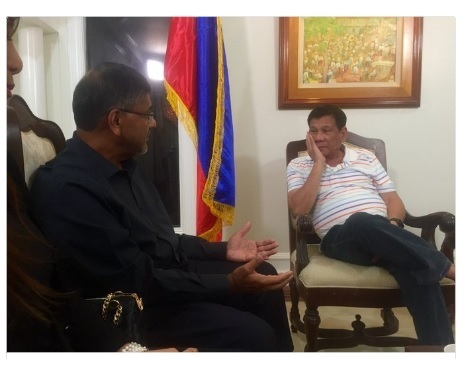 In a series of tweets following his courtesy call with Duterte in Davao City, Ambassador Asif Ahmad said he also met with some members of the incoming Cabinet with whom he was able to discuss the president-elect’s priorities. Through President-elect Rodrigo Duterte's chosen Finance secretary Carlos Dominguez through only revealed an eight-point economic agenda on May 12 that included the retaining of the macroeconomic plans of the Aquino administration and the tweaking of the tax system. But Ahmad said that the 10-point economic plan revealed to him included science and innovation, as well as reproductive health. While Ahmad did not detail the kind of expertise the UK could share, the Confederation of British Industry’s (CBI) said that the economic strengths of United Kingdom (UK) included automotive, creative industries, aerospace, agri-food, green technology and sciences, chemicals and pharmaceuticals, and knowledge intensive business services. The British envoy meanwhile also said that Duterte discussed an inclusive peace process for Mindanao during their meeting. Ahmad said that “We share common goals in regional security and a rules based global system with @RRD_Davao,”. In an earlier set of tweets, the British Ambassador shared photos of him and Duterte exchanging gifts. Duterte also met with United States Ambassador Philip Goldberg and German Ambassador Thomas Ossowski. A GREAT NEWS TO START OUR WEEK! PNOY: I FULFILLED MY PROMISES TO MY "BOSSES"
PDP-LABAN - LP COALITION IN THE CONGRESS?